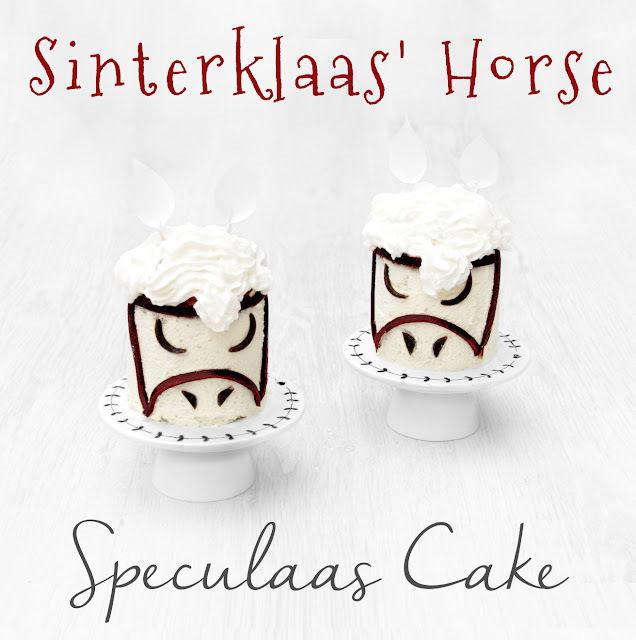 I mentioned yesterday morning with my Sinterklaas canvas cake that I was making little speculaas cakes for Sinterklaas dessert, and here they are! Sinterklaas doesn't have reindeer or a sleigh like Father Christmas, he has but one white horse. 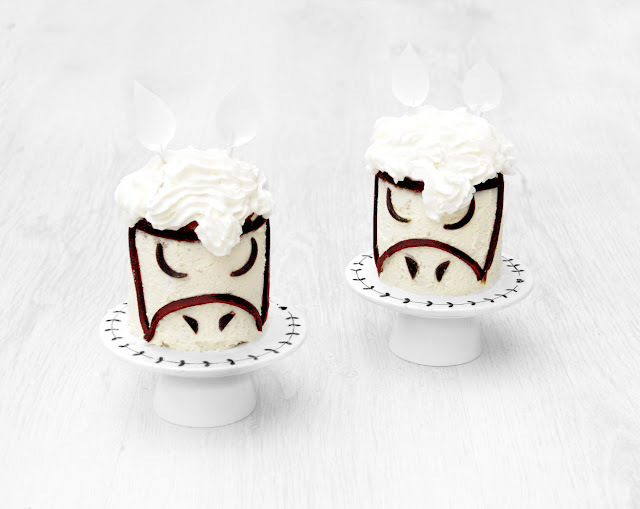 So I decided, after seeing a few cute reindeer cakes, that I would try to make a little horse instead. These two cakes are a simple speculaas Sinterklaas cake, which is deliciously spiced, covered in whipped double cream with a squirt of aerosol cream on top, strawberry and blackcurrant BEAR yoyo cut with a circular cookie cutter for the detail - any fruit roll up will do, or you could just pipe it - and some last-minute paper & toothpick ears. They're also tiny. I used two 3x3 inch cake tins for this, which is absolutely perfect to serve 4. I used them at Easter a couple of years ago and made one cake each because they were so small, and it turned out to be, quite simply, too much. 1. Preheat the oven to 180 C/350 F/gas mark 4 and line or grease two 3x3 inch cake tins. 2. Cream together the butter, sugar and speculaas spice until thoroughly combined. 3. Add 1 egg and half of the flour, mix to combine, then add the remaining egg and flour. 4. Add the broken biscuits to the batter, if using, combining well, then divide between the two cake tins. 5. Bake in the centre of the oven for 25 minutes, then let cool. 6. Once the cakes have cooled, begin to beat the heavy cream in a bowl until thick. 7. Using a palette knife or the smooth edge of a butter/table knife, spread the cream around the sides of the cake. Be patient! 8. Take your yoyos or fruit rolls and, using a circular (or the rounded edge of a heart) cookie cutter, cut two eyes and two nostrils for each horse and arrange on the cream. Cut the remaining lengths into strips 5mm thick and arrange as a bridle - one over the nose, one above the eyes, and two down the sides. 9. When ready to serve, cover the top in whipped cream and poke in some paper ears. I taped ear shapes to toothpicks. • I used Stork cakes vegetable spread in place of butter. • You can put pepernoten, kruidnoten or even just gingerbread biscuits into a bag and break them up with a rolling pin and add them to the mix.